This might be one of my favorite savory breakfasts I’ve ever created. Yes, I use two eggs. Eggs are really good for you, plus the goo factor was unbelievable as they melted into the cheesy, salty oat bran. I used oat bran since I didn’t have grits, but oat bran is packed with fiber. I ate this around 8:15 and I’m still full two hours later, which is humongous for me. I’ll probably not need anything else until lunch and even then I’ll probably go with something light. Eat this when you won’t be in a kitchen for a while! Combine oat bran and water in a small pot over high heat. Add salt and pepper to taste. When mixture begins to bubble, lower heat to simmer and stir vigorously to combine. Keep adding water as this will cause the oats to puff up and expand (plus it helps to keep it from sticking to the bottom of the pot). Add goat cheese and a bit more water so the cheese melts into the bran. Spray a separate skillet and cook eggs over easy. When oats have reached desired level of thickness (or done-ness), pour into serving bowl. 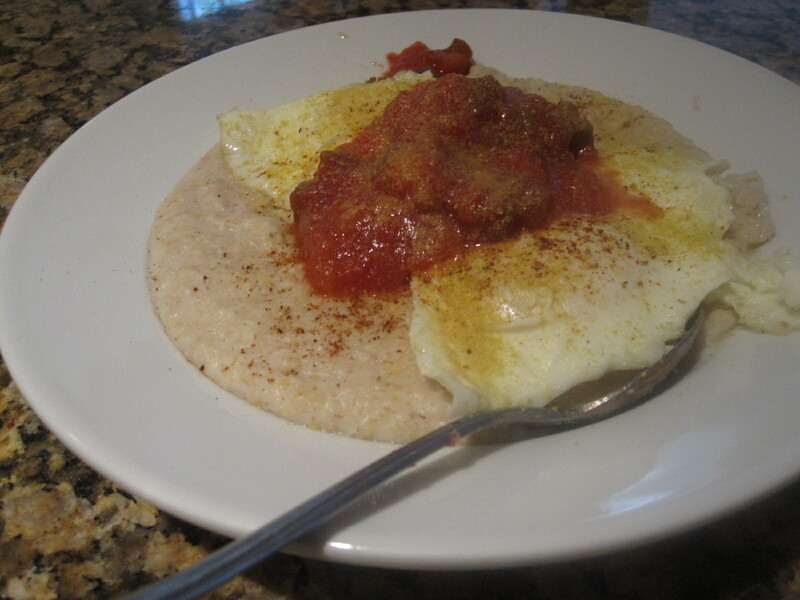 Top with eggs, salsa, paprika, and nutritional yeast to taste. Scarf. Try not to lick the bowl.